I had kind of been wanting to read this book ever since Anne Bogel recommended it to several guests on her podcast. Yes, I'd been wanting to read it . . . but I didn't really expect to like it. It was being touted as a Great Gatsby knock off (even though the two stories are set a decade apart), and that comparison told me three things: there would be loose morals, lots of drinking, and a bunch of bad decisions. And yes, yes, and yes, it was all of those things. But . . . I found myself really loving the characters and the story and being drawn into an intricate web of choices and consequences that was much more compelling to me than anything in The Great Gatsby. "You see that thirty-year-old blonde next to Jake? That's his fiancee, Carrie Clapboard. Carrie moved all manner of heaven and earth to get into that chair. And soon she will happily oversee scullery maids and table settings and the reupholstering of antique chairs at three different houses; which is all well and good. But if I were your age, I wouldn't be trying to figure out how to get into Carrie's shoes--I'd be trying to figure out how to get into Jake's." But the general idea, and the one that all of these women seem to subscribe to, is that nothing is out of their reach and that with a little ingenuity and execution of their natural talents and abilities, they can have whatever they want. And I have to admit, it was rather thrilling (and terrifying) to see these women do their thing. "It is a bit of a cliche to characterize life as a rambling journey on which we can alter our course at any given time--by the slightest turn of the wheel, the wisdom goes, we influence the chain of events and thus recast our destiny with new cohorts, circumstances, and discoveries. But for most of us, life is nothing like that. Instead, we have a few brief periods when we are offered a handful of discrete options. Do I take this job or that job? In Chicago or New York? Do I join this circle of friends or that one, and with whom do I go home at the end of the night? And does one make time for children now? Or later? Or later still? "In that sense, life is less like a journey than it is a game of honeymoon bridge. In our twenties, when there is still so much time ahead of us, time that seems ample for a hundred indecisions, for a hundred visions and revisions --we draw a card, and we must decide right then and there whether to keep that card and discard the next, or discard the first card and keep the second. And before we know it, the deck has been played out and the decisions we have just made will shape our lives for decades to come." I have seen this in my own life, and it's sometimes why I feel a little panicked because I can see how being in the right place at the right time with the right people can make all the difference in the world. And in this book, it does. (And I kind of love it that the man Katey ends up marrying is really just a very minor character in her life in 1938 (he's there, but you have to watch very carefully for him), but their interaction ends up being just enough when they reconnect later on.) I'm always worried that I'll say no to something when I should have said yes or vice verse and tha,t because of that, I'll miss out on a treasured friendship or an awesome job or the experience of a lifetime. "Whatever setbacks he had faced in his life, he said, however daunting or dispiriting the unfolding of events, he always knew that he would make it through, as long as when he woke in the morning he was looking forward to his first cup of coffee. . . One must be prepared to fight for one's simple pleasures and to defend them against elegance and erudition and all manner of glamorous enticements." This review is starting to feel like it's getting a little deep, but the book never felt that way. In fact, it wasn't until I was going back through my bookmarked pages that I realized just how many life lessons were tucked among the other happenings. That's because this book is so well written--not in a flowery, over the top way, but in a snappy, vivid, to-the-point way. "On the morning of Friday, July first, I had a low-paying job at a waning publisher and a dwindling circle of semi-acquaintances. On Friday, July eighth, I had one foot in the door of Conde Nast and the other in the door of the Knickerbocker Club--the professional and social circles that would define the next thirty years of my life. That's how quickly New York City comes about--like a weather vane--or the head of a cobra. Time tells which." But it was the dialogue, oh the dialogue!, that really got me. In fact, after I finished it, I told people that I would recommend it for the dialogue alone. "You've got a . . . lot of books," he said at last. "Are you . . . seeing anyone for it?" Which, speaking of Wallace, he's a top-notch guy and one of my favorite characters in the book. "You're very good with the closing remark, Anne. "Yes," she said. "It's one of my specialties." I specifically remember when I read that one because, as it turns out, Amor Towles is actually very good at the closing remark; almost every chapter ends with just the right little punch or jab to hit its mark. Amor Towles' most recent novel, A Gentleman in Moscow, has received a lot of attention this year, but I had very little interest in it because I thought the title sounded boring. 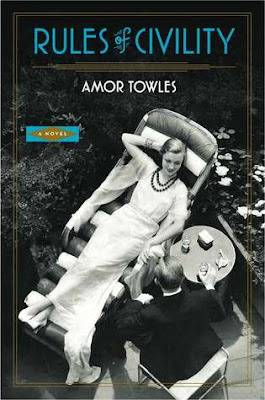 However, after reading this book, I'm pretty sure I'll read anything Amor Towles writes. I'm convinced he can make just about any subject absolutely compelling. Yes, I agree with you that this book is beautifully written. However, unlike you, I just couldn't get past the poor choices these characters made (I have a really low tolerance for stupid life choices). But there are passages from this book I still remember (you picked out one of them, about the dad looking forward to his simple pleasure of coffee every morning, and Katey's simple pleasure being Dickens, loved that), even though I read this book several years ago. I've been looking forward to reading A Gentlman in Moscow, if I ever get it off the stupid waiting list for audio.